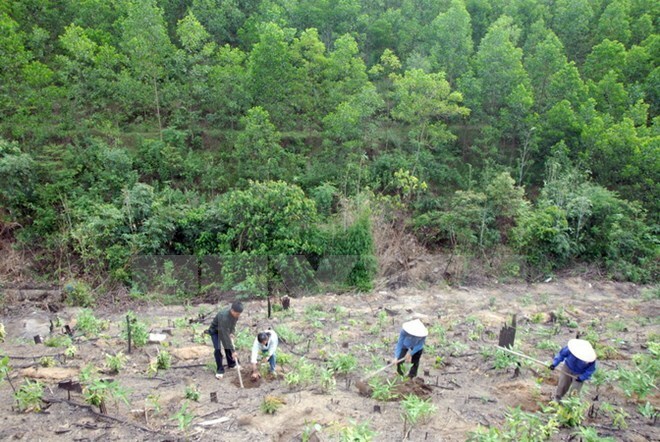 Hanoi (VNA) – Central Highland provinces are taking drastic measures to restore, protect and develop natural forests. The localities have implemented the directions of the Party Central Committee’s Secretariat and Prime Minister Nguyen Xuan Phuc on closing natural forests to avoid over-harvesting wood. According to Deputy Minister of Agriculture and Rural Development Ha Cong Tuan, the Central Highlands has evaluated the projects, including 565 utilising forests and forestry land to grow rubber and 220 others turning exhausted forestry land into rubber farms. Local authorities have strictly punished organisations and individuals violating State management on forests and forestry land. They are also intensifying forest management, protection and wildfire prevention efforts. Tuan said the localities will strictly manage socio-economic development plans that may harm the area and the quality of forests, especially natural and protective ones. They will also weigh the social, economic and environmental efficiency of projects and suspend wood processing facilities violating legal regulations, he added. The Central Highlands, which comprises five provinces of Dak Lak, Dak Nong, Lam Dong, Gia Lai and Kon Tum, has nearly 3,321,000 hectares of forests and forestry land. Forest coverage hit 46.01 percent in 2016, a year-on-year decline of 0.07 percent. In 2016, violations of forest protection and management fell by 8 percent compared to the previous year. However, in the first six months of 2017, cases rose by 7 percent.